Apple hasn’t updated the Mac Pro since 2014. You haven’t usually heard “same old, same old” applied to Apple — until recently. Get used to it. If the rumors are right, Apple will unveil a new iPhone next month that will differ little from the one in my shirt pocket. An improved camera and the elimination of the old-school headphone jack are about all we can look forward to. Still, iPhone loyalists will have at least a little incentive to line up outside the Apple store. Not so the millions who use Apple’s venerable line of Mac personal computers. Shop for one of these, and your choices are mostly the same as they were a year or more ago. Certainly the popular Retina MacBook Pro is showing its age, having gone without an update for well over a year. But it’s much worse for other models. Apple’s low-cost Mac Mini hasn’t been updated since 2014. 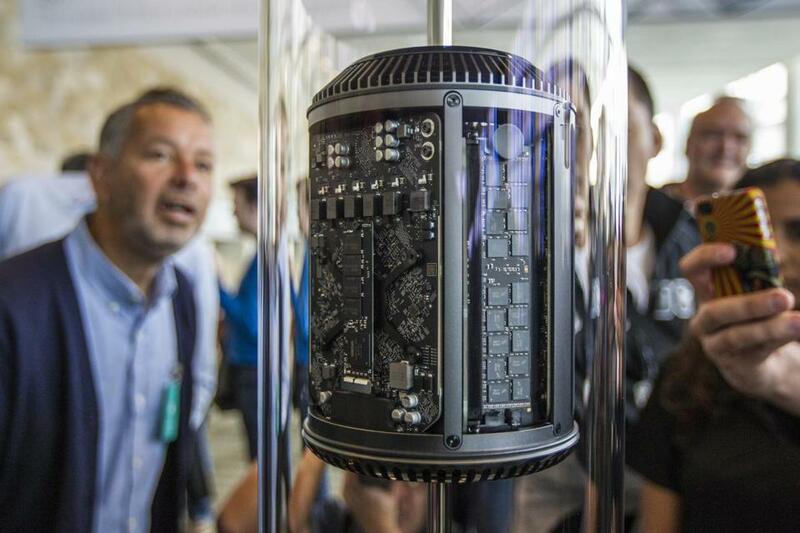 Then there’s the Mac Pro, Apple’s top-of-the-line machine for movie editors and graphic artists. The Mac Pro was state-of-the-art when it was released over 2½ years ago, and it had a price tag to match: $4,000. Yet today, Apple’s still selling the same machine, at the same price. That would be commercial suicide in the Windows PC world. Raza Haider, executive director of commercial computing at Dell Inc., said his company upgrades pretty much every model every year. “We always want to make sure that our users are getting the latest and greatest performance,” Haider told me. Dell has no choice. If it rested on its laurels the way Apple has done, a horde of rival Windows PC makers would happily take up the slack. After all, Windows machines are utterly interchangeable. Don’t like the features on the latest Dell? Buy an HP or a Lenovo instead. Your software won’t care which brand of computer it runs on, so get the hottest one you can afford. Faced with fierce competition from Android smartphones, the company obliges its fans with annual iPhone updates. But Mac users are far less likely to defect. They love the unique operating system and dread the expense and trouble of converting to a Windows machine, even one with a newer, faster processor. And after all, the speed boost would hardly matter. Intel, which makes about 95 percent of the world’s PC processors, keeps producing better and better chips. But lately the improvements have been marginal. Moore’s Law, the principle that computers would double in processing power every couple of years, is finally petering out. It’s bad news for Intel, whose chief executive, Brian Krzanich, warned in June that most users now go for five or six years before thinking about a new PC. That’s why Intel is laying off 12,000 employees, 11 percent of its global workforce. Clearly, Apple is onto something. Why invest millions in annual Mac updates, when few customers will benefit? For that matter, why offer price cuts on aging Macs, when customers keep buying? For quarter after quarter, Mac sales continued upward, bucking the yearslong slump in Windows PC sales. But not lately. Mac sales have now declined for three quarters in a row, probably because many potential buyers are sick of being offered leftovers. Actually, the message is coming through loud and clear. On Wednesday, Bloomberg Technology reported that Apple will soon roll out a new batch of MacBook Pro laptops. They’ll feature a slightly faster processor, a bit more storage, and other marginal improvements, like a keyboard that replaces the traditional row of function keys with a long, thin touchscreen. Still, all these enhancements add up to nothing much. Expect the same from the next iPhone, from new Android smartphones and Windows computers, and for all kinds of tablet computers. There’s been a great leveling off of innovation in digital hardware, and apart from a busted touchscreen or a crashed hard drive, it’s hard to see much point in buying the latest gadget. So you might as well stick with same old, same old. After all, that’s what you’ll get — even if you get something new.